SL NEO platform contains a set of instruments that allow changing parameters of audio tracks while importing files. The set of instruments is identical both for the operations with manual import of files in applications Air Manager and News Cut and for the automatic import that is implemented with the help of Transfer Manager. In the field General, specify the basic parameters of the final track: Sample Rate - the sampling frequency, Bit per Sample - quantization level, Channels - the number of audio channels in the track, Codec - choosing the codec, Bitrate - setting up the speed of the stream for compressed audio data. 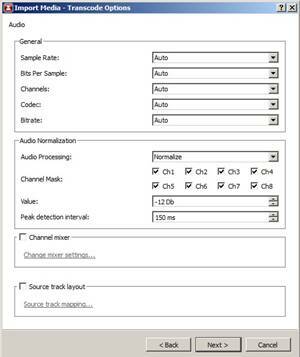 Ј Normalize - normalize the audio level by defining its value in every chosen audio-channel of the file to the level by dBFS (the value is set up in the field Value). The parameter Peak detection interval defines the time interval in which the average value of the level will be calculated in milliseconds. Inertance while analyzing the initial audio is necessary for exclusion of binding to the peak values when normalizing the whole track. The value Peak Detection Interval of 1 ms practically indicates normalization by peaks; the value of 50-200 milliseconds is applied to most materials. When using the function of normalization, you should mark the audio channels that will be normalized (item Channel Mask). The necessity to choose channels for normalization is explained by possible situations, when the УusefulФ sound is presented at only one channel, and the other one contains silence (noise). If you choose both channels, after normalization the level of sound of the channel with noise will reach the normalization level. The field Channel Mixer is a virtual switcher-mixer of audio channels with 16х16 dimension. Source Track Layout - the instrument that allows transcoding the initial audio-tracks and forming several output tracks (audio programs) from them. Channel is an audio channel being part of the track (the maximal number of channels in all tracks of the media-material is sixteen). In the field Track Number you should specify the total amount of tracks in the output audio. In the field Src Track #1...8 define the number of the initial track or choose the parameter Any if you donТt know the track number. In the field Src Channels specify the number of audio channels of the initial track or set up the parameter Any, if you donТt know the number of channels. In the field Src Codec define the type of the codec for the initial track or choose УAnyФ if the codec is unknown. The algorithm of decoding and recognition of tracks can automatically define the parameters of the track on the basis of minimal information about it. For example, we know that the initial material contains 2 tracks: Mpeg-1 Layer-2 stereo and Dolby Digital 2.0 (AC3). Besides, the number of channels and their sequence numbers are unknown. When entering the parameters of initial tracks, it is enough to define the types of codecs; herewith, the fields Src Track, Src Channels can be set as УAnyФ. In the field Dst Channels you should set the number of channels for every output track, otherwise the mode AC3 bypass (pass-through) will be activated. The algorithm for encoding the output audio is PCM. This operation allows simultaneous import of files and conversion of data batches of the initial track Dolby Didital 2.0 (AC3) into the PCM batches without decoding the AC3 track and without any changes to the initial track. This procedure is implemented in case, if you need broadcast from the server output of the original AC3 track as part of SDI + AES Audio Embedded. To activate this mode while importing files, you should configure the window Track Layout: in the field Track Number specify the total amount of the audio programs in the output audio Ц 1; in the field Src Track #1 define the sequence number of the initial track that contains AC3 data, or choose Any. 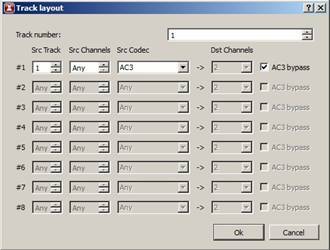 In the field Src Channels specify the number of audio channels in the initial track (six) or choose Any; in the field Src Codec define the codec type for the initial track - AC3; in the field Dst Channels activate AC3 bypass. After implementing this operation, the AC3 data batches will be converted into PCM data batches that will being broadcasted from the server output as a part of AES/Embedded audio during the clip playout. Note: the function doesn't work with the initial AVI-files; when watching the clip with AC3 pass-through track in the window File Monitor, you will hear fuss, because File Monitor doesn't have a mechanism for decoding AC3 data batches within PCM. Let's consider the variant of creating two independent audio programs from one initial AC3 track. To create a stereopair, first configure the window Track Layout: in the field Track Number specify the number of programs (tracks) in the output audio Ц 2; in the field Src Track #1 enter the sequence number of the initial track that contains AC3 data; in the field Src Channels define the number of audio channels in the initial track (6) or choose Any; in the field Src Codec choose the type of codec for the initial track Ц AC3; in the field Dst Channels enter the number of output channels Ц two. After these actions the AC3 track will be decoded and converted into a stereopair. In the field Src Track #2 enter the sequence number of the track that contains AC3 data and implement settings for the conversion of AC3-Ac3 pass-through. In the field General you may leave the values Auto for the parameters of the output audio: the value Channels will be automatically set as four, Codec will be set up as RAW PCM by default. Air Manager by default has the mode of displaying two audio channels; you can extend the number of channels in the menu FIle/Configure, section Preview, item Sound Channels (the number of audio channels that will be displayed while viewing materials in the window File Monitor). After applying changes you should reload Air Manager. The buttons under the indicator of levels in the window File Monitor allow the user to choose channels for listening through the stereo audio output of the client station: L/R - switching the channel to the left/right output channel respectively; A Ц switching the channel to the left and right channels; Ø Ц absence of switching.